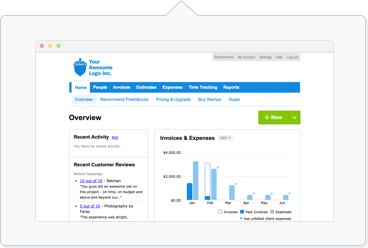 In 2018, we've added more new features and improvements to FreshBooks so you can focus on running your business successfully. Looking for 2019 updates? Go here instead. Matching up your accounts with FreshBook entries is now possible with Bank Reconciliation. You can now select Estonian as an option for Invoices, Estimates and Proposals. You can now invite up to ten Accountants to your business to help review your financial reports, manage your Invoices, Payments, Expenses and more. View your assets, liabilities and equities in the new Balance Sheet Report. Reports have been moved to its own section, Other Income is now under the Invoices section, and Chart of Accounts is now under a new section called Accounting, all to improve the navigation experience. You can now add credit cards directly into a Client's profile with Advanced Payments. Any Saved Credit Cards are now visible in the Client's Profile. You can now use the search box in the Expenses section to filter by Uncategorized expenses while organizing your Expenses. When adding payments in bulk, you can choose to apply the same information to all payments if needed. If you've created additional businesses that you no longer need, you can now delete it after cancelling it. You can now select Norwegian as an option for Invoices, Estimates and Proposals. With Advanced Payments, you can now process credit card payments over phone or in person, as well as save credit card information for future Invoices and Recurring Templates. Clients now have the option to save their credit card information while paying Invoices. Time Entries can now be rebilled onto Invoices in the FreshBooks Mobile App for Android. When making an Invoice and adding items, the option to add unbilled time (if there are any) will appear. You can now add and view the Reference field on all Invoices in the FreshBooks Mobile App for both Android and iOS. Expenses can now be rebilled onto Invoices on the FreshBooks Mobile App for iOS. Referring FreshBooks to others is now possible by sending an email, a FaceBook Message, a FaceBook post, or by copying your unique referral link. A deleted section is now available for any deleted Recurring Templates, and you can also undelete any Recurring Templates. You can now send multiple Invoices by Email in one go. Multiple Invoices can now be downloaded as separate PDF files. An Unbilled Time widget has been added to the Dashboard so you can easily see how much unbilled time you have per client, and quickly generate invoices for the time. Invoices can now be archived, and you can add or view the Tax Name & Number in your Company Profile (if applicable) on the FreshBooks Mobile App for iOS. You can now add new clients in bulk by importing in with a CSV file. Enabling late fees and late payment reminders is now possible on any Invoice on the FreshBooks Mobile App for iOS. Greek and Romanian are now options for Invoices, Estimates and Proposals. Now you can mark time as unbilled if you'd like to bill for it again, or if you've accidentally marked the wrong time as billed. Items & Services can now be managed in one place, where you're able to update rates, taxes and more. You can now select multiple Invoices and use the Actions button to mark them as Sent in one go. Expenses can now be rebilled onto Invoices in the FreshBooks Mobile App for Android. When making an Invoice and adding items, the option to add unbilled expenses (if there are any) will appear. Expenses can now be imported in bulk with the CSV file import option. Danish and Swedish are now options for Invoices, Estimates and Proposals. Now you can easily monitor your streams of revenue from both Other Income and your Invoices using the Revenue Streams graph on your Dashboard. The FreshBooks Mobile App for iOS now has a Dashboard view, making it easy to get a quick look at your business' outstanding invoices, profit and spending while on the go. You can now rebill your time entries on Invoices using the FreshBooks Mobile App for iOS. When making an Invoice and adding items, the option to add unbilled time (if there are any) will appear. Expenses and Expense Categories can now be marked as COGS, whether you rebill them onto an Invoice or not. You can now request your Clients' e-Signature before they accept a Proposal before beginning work. Non-invoice income like online sales and ads can now be tracked by logging them as Other Income. German, Italian, and Portuguese are now added as options for Invoices, Estimates and Proposals as well. Spanish, Spanish (Latin America) and Dutch languages have now been added as options for Invoices, Estimates and Proposals. Add new team members as a Business Partner, Basic Employee or Contractor depending on which permissions you want to grant the team member. A Dashboard view has been added to the FreshBooks Mobile App for Android, making it easy to get a quick look at your business' outstanding invoices, profit and spending while on the go. You can now see attachments on existing Proposals on the FreshBooks Mobile App for iOS. Payment schedules can now be set up from the FreshBooks Mobile App for iOS. The FreshBooks Mobile App for iOS now has three additional push notifications. Now you can be notified when a Client hasn't viewed an Invoice, Estimate or Proposal in 7 days, when a Client comments, and when an Invoice becomes overdue. A Reference Field has been added to the Invoices and Estimates templates so that you can include a Purchase Order (PO) number, project code, or any other 25 character reference on your Invoices. Team Members' rates can now be managed from the My Team page with the addition of a Billable Rate field. Now you can enable push notifications on the FreshBooks Mobile App for iOS to be alerted of important activity in your account. This includes unsuccessful payments, declined payments, Estimate accepted and Proposal accepted.